Destino Maya Honduras 2019, es una competencia que se desarrolla por primera vez en Copán. 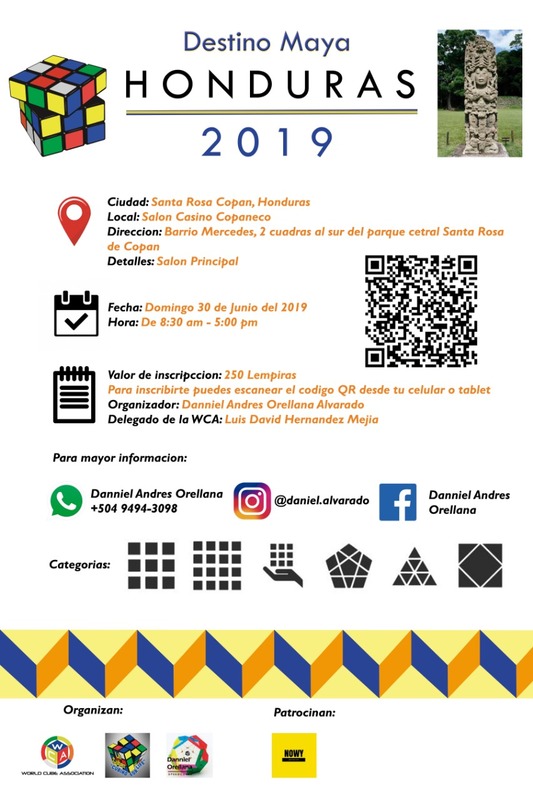 Con el objetivo principal de aumentar la comunidad en esta área del país y así promover más el speedcubing. Destino Maya Honduras 2019, it´s a competition that takes place for the first time in Copán. With the main objective of increasing the community in this area of the country and thus promote more speedcubing. The base registration fee for this competition is L250 (Honduran Lempira). On the spot registrations will be accepted with a base registration fee of L250 (Honduran Lempira) if the competitor limit has not been reached by . Efectuar el pago respectivo, el costo es de L 250.00 de base que incluye participación en TODAS las categorias. Tambien incluye: Gafete y Diploma de participación. Aparte patrocinado por ´´Pan Casero Mi Delicia´´ (Dos bolsas de pan y café de la región). Medallas para los primeros 3 lugares y cubos para los primeros lugares de cada categoría. To make the respective payment, the cost is L 250.00 of base that includes participation in ALL the events. It also includes: Badge and Participation Diploma. Likewise hosted by ´´Pan Casero Mi Delicia´´ (Two bags of bread and coffee from the region). Medals for the first 3 places and cubes for the first places in each event. You are viewing the schedule for the venue Salón Casino Copaneco. ∆ Habrá pago en la puerta con una razón justificada. Para trabajar en la mejor solución posible, enviar una breve explicacion por privado al correo "klar_0810@yahoo.es". Δ Registration closes June 30. Δ There will be payment at the door with a justified reason. To work on the best possible solution, send a brief explanation by private mail to "klar_0810@yahoo.es"